The Crossfire Minute: The Kingdom...the Extreme Priority of the Believer. The Kingdom...the Extreme Priority of the Believer. A few verses earlier Jesus says don’t worry about ‘life’. His words challenge the focus for daily living. They challenge our priorities for life itself. Jesus brings forth two key challenges: First, to NOT set our hearts on or worry about the normal needs of life, i.e. food, drink, clothes, etc. To ‘set your heart on’ means to seek after by meditating upon something. To ‘worry’ means to have a troubled or unsettled mind about something. Jesus….were you serious about those words?! Whether you live in Africa or America, rich or poor, that is an extreme challenge. The human tendency is to focus on things of the temporal realm that either make us comfortable or satisfy a desire of body or soul. Food, drink and clothing are all tangible aspects of living on this earth. They are needs of every person. His second challenge is ‘seek His Kingdom and these things will be given to you as well.’ Most believers spend considerable time focused on temporal things because they are visible and appeal to the 5 senses on a continual basis. But to seek His kingdom is to tap into the unseen realm; the spiritual realm, the heavenly realm. Jesus says this MUST be our priority if we are to distinguish ourselves from pagans! Wow! If we seek first food, drink and clothing and worry about life, we blend into the pagan world system. 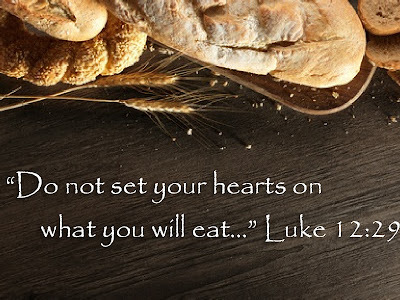 Jesus did not say ‘seek after food, drink, clothes; worry about your life and the Kingdom will be given to you as well’. We have the power to provide food, drink and clothing by ourselves and for ourselves, if we focus our time and energy on those things. The vast majority of the world does this. However, when that is where we set our hearts and the focus of our minds, we become our own provider. We become our own Kingdom…a kingdom of worry and self-sufficiency to meet every need and desire. Jesus’ words declare a kingdom principle that is extreme…seek first, put first, pursue all things that relate to the Kingdom of God AND THEN other things we need will be given to us. The secret to not worrying is found in our seeking, pursuing, and setting our hearts on the Kingdom and His presence. As we do so there is little room for worry and fretting about other things. His presence consumes all the space! In this Kingdom, God is our provider. He is our sufficiency. He is our sustainer of life. If we truly desire to live the extreme life of the Kingdom of God, we must take these words seriously. We can operate in faith and not presumption. We can practice ‘seeking His Kingdom’ as our top priority, allowing Him to show Himself faithful to provide the temporal things. God’s grace makes room for every person, every leader, every believer to grow into the fullness of living in His kingdom. It is only then that we live with clarity and contrast to the world around us. We will live extremely in His kingdom.